Belden – For only the second time, the Circuit reverses an inter partes review determination, but this is the first time the Circuit has ruled that claims that had not been invalidated, should have been. The panel affirms the finding of obviousness as to claims 1-4, finding ample evidence to support the Board ruling. However, as to claims 5 and 6 the Board had found valid, the panel finds that there is "no substantial evidence" to support the Board's determination. Finding a clear motivation to combine the prior art references, the panel rules that the Board's determination of nonobviousness rests on legal errors. Claim 5, dependent on claim 1, requires that the transmission media be " twisted pairs of insulated conductors." '503 patent reexamination certificate. Claim 6, dependent on claim 5, requires four such pairs. Berk-Tek's predecessor, Nexans, Inc., petitioned for inter partes review of all claims, asserting anticipation and obviousness based on seven prior-art references. The PTAB instituted a review of all claims, finding likely obviousness of the methods of claims 1 and 4 based on a ‘910 Japanese Patent. It found likely obviousness of the methods of claims 2 and 3 based on JP '910 together with either a U.S. ‘582 patent or a ‘694 Japanese Patent. And it found likely obviousness of the methods of claims 5 and 6 based on JP '910 together with a ‘046 Canadian Patent. The central reference, JP '910, describes a method of making a communication cable, illustrated below. The method entails extruding a core (thread-like object 1) through heated rollers (2a-2c) to form four grooves in the core, located at corners of a square when viewed in cross-section. The core and four conducting wires (4a-4d) are fed through a die (wire-splitting board 5), the wires placed into the grooves on the core, and the assembly bunched, stranded, and jacketed to form a cable. JP '694 and US '582 also describe methods of making a cable or cable core, illustrated below. JP '694 teaches passing a group of wires and shielding tape through a first die (plate 31), then a second die (plate 32), and finally a set of shaping tubes that wrap the shielding tape around the wires. JP '694, col. 4, lines 7-28. US '582 similarly teaches making a cable core, in which a metallic tape and two groups of wires are fed through a first die (plate 67) and a second die (plate 71). CA '046 describes a telecommunications cable containing twisted pairs of conducting wires, separated by a spacer to minimize cross talk. The patent illustrates different spacers separating four twisted pairs of wires. CA '046, col. 3, line 36 to col. 4, line 37. In its Final Written Decision the Board concluded that, "by teaching alignment of the grooves and the conductors at board 5, JP '910 suggests using board 5 to prevent twisting motion of core 1. That is, a person of ordinary skill in the art would have recognized that preventing twisting motion of core 1 in relation to board 5 would maintain alignment between" the grooves and conductors "in accordance with the teaching of JP '910." As to claim 2, the Board concluded that US '582 and JP '694 each teach "the benefit of a third die," stating that adding a third die to JP '910 would have "involve[d] merely a predictable use of a prior art element . . . to perform the same function it was known to perform and to yield no more than one of ordinary skill would expect from such use." As to claim 5: The Board determined that "JP '910 cannot be understood reasonably as teaching or suggesting a method of manufacturing all types of twisted cables having a separator," in particular "conventional twisted cable . . . that includes twisted pairs of individually-insulated conductors." Belden appeals the cancellation of claims 1-4 and the denial of its motion to exclude. Berk-Tek appeals the upholding of claims 5 and 6. Whether a claimed invention would have been obvious is a question of law, based on factual determinations regarding the scope and content of the prior art, differences between the prior art and the claims at issue, the level of ordinary skill in the pertinent art, the motivations to modify or combine prior art, and any objective indicia of non-obviousness. We review the Board's compliance with the governing legal standards de novo and its underlying factual determinations for substantial evidence. In challenging the cancellation of claim 1 for obviousness, Belden argues that JP '910 does not teach making cables, but only transmission lines (a component of a cable), and it disputes the Board's finding of a motivation to use board 5 in JP '910 to prevent the twisting of core 1. 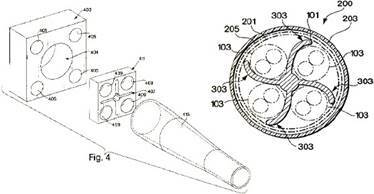 The Board found that "[t]he purpose of the invention of JP '910 'is to provide a method of manufacturing plastic insulated communication cable.'" That finding is supported by substantial evidence. The title of JP '910 is: "A method of manufacturing plastic insulated communication cables." JP '910 claims "[a] method of manufacturing plastic insulated cables." The patent further explains: "The present invention relates to a method of manufacturing plastic insulated communication cables." Belden argues that, despite those descriptions, JP '910 teaches only the making of quads, which themselves are not cables but mere components of cables. But the claims of the '503 patent do not so limit the meaning of "cable" to a category that excludes quads, and Belden does not dispute that it never argued for a construction of "cable" before the Board. Thus, Belden's argument that JP '910 does not describe a method of making communication cables fails. The Board also found that, by teaching the need for alignment of the conductors and core at board 5, JP '910 suggested using board 5 to prevent the twisting of core 1. Although the Board twice stated that "board 5 could have been used to prevent twisting of core 1 by one with ordinary skill in the art exercising ordinary creativity," it did not stop there—and properly so, because obviousness concerns whether a skilled artisan not only could have made but would have been motivated to make the combinations or modifications of prior art to arrive at the claimed invention. See InTouch Technologies, Inc. v. VGO Communications, Inc., 751 F.3d 1327 (Fed. Cir. 2014). The Board found that "[v]iewed as a whole, JP '910 does teach the importance of avoiding any misplacement of the conductors in relation to the core," "[a] person with ordinary skill in the art would have recognized that such alignment of the grooves on core 1 with the fixed positions of the conductors on board 5 cannot be maintained if core 1 twists in relation to board 5," and "[t]herefore, by teaching alignment of the grooves and the conductors at board 5, JP '910 suggests using board 5 to prevent twisting motion of core 1." And the Board reiterated its earlier finding in its Institution Decision: " 'Given that JP '910 articulates a special need to have the wires aligned at precise locations on the core during stranding after passing through wire-splitting board 5, one with ordinary skill in the art would have known that the passage of core 1 through wire-splitting board 5 preferably should be made such that twisting of the core causing misalignment of the wires would be prevented." Those findings suffice to show that claim 1 (and claim 4) must fall, because the findings are supported by substantial evidence. In the circumstances here, involving a simple point in a mechanical field and one very close piece of prior art, the Board was entitled to rely on its own reading of JP '910—supported by the Petition's observations about it—to find that a skilled artisan would have understood the importance of aligning the core and conductors and the connection between achieving such alignment and preventing the core from twisting at the aligning die. As to claims 2 and 3, Belden does not dispute that both US '582 and JP '694 disclose a third die. Belden disputes only the Board's finding of a reason to combine a third die with the method of JP '910. However, we hold that claim 2 (and claim 3) must fall, because the findings are supported by substantial evidence. As to claims 5 and 6, Berk-Tek argues that a person of ordinary skill in the art seeking to manufacture cables disclosed in CA '046—with four insulated twisted pairs and a separator—would have been motivated to use the method of JP '910 to solve the alignment issues common to manufacturing the cables in both prior-art sources. Even giving the Board the deference it is due under the substantial-evidence standard of review of factual findings, we agree that the record requires the finding Berk-Tek urges. The Board's contrary finding rests on legal errors. There is no meaningful dispute here that the two pieces of prior art in combination teach or suggest the methods of claims 5 and 6. The dispute concerns motivation to combine. The Petition and the Institution Decision reveal the two ways in which that issue was presented and considered: whether a skilled artisan would substitute the twisted pairs of CA '046 into the method of JP '910; alternatively, whether a skilled artisan making the cable of CA '046 would look to the JP '910 method to make it. As the Board found, it is "undisputed that CA '046 discloses 'a helically twisted cable.'" There is no dispute that the twisted pairs in CA '046 need to fit into the notches of ( i.e., be aligned with) the separator, as shown in the two figures from CA '046 reproduced above, for the resulting cable to be made. And the Board correctly recognized in its discussion of claims 1 and 2 that JP '910 clearly teaches the importance of aligning conductors with a separator (core), and suggests doing so with a die to prevent twisting of the separator, before they are all bunched together for twisting in a stranding device. That evidence points clearly toward a motivation of a skilled artisan to arrive at the methods of claims 5 and 6 based on JP '910 and CA '046. None of the Board's reasons for concluding otherwise in its Final Written Decision withstands scrutiny through the lens of governing law. In short, the record is one-sided on the proper question of whether JP '910 taught a solution to the problem of aligning cable components that a skilled artisan would have been motivated to use in making CA '046's cables. The Board erred in determining that Berk-Tek had not proven the obviousness of the methods of claims 5 and 6 of the '503 patent by a preponderance of the evidence. Belden challenges the Board's denial of the motion to exclude the Baxter declaration that Berk-Tek submitted with its Reply. It argues that the Board violated a regulation governing evidence submitted with a Reply and two aspects of the Patent Office Trial Practice Guide, thereby relying on evidence to which Belden lacked a fair opportunity to respond. We review the Board's evidentiary ruling for abuse of discretion, which may be found if the Board violated governing law. We reject Belden's contentions, and agree with the Board that Baxter's declaration fairly responds to Clark's declaration and is generally in fair reply to Belden's response to the revised petition." We see no error in that ruling. Comment: In the only other reversal of the PTAB in an AIA appeal, the Circuit ruled that even under the broadest reasonable interpretation standard, claim construction must be based on the claims and specification. Microsoft Corp. v. Proxyconn, Inc., 789 F.3d 1292 (Fed. Cir. 2015). Because of the overly broad and erroneous claim construction, the panel reversed and remanded the Board's determination of invalidity of a number of the claims.